Measuring GDP and its components is tricky business. GDP is supposed to measure all economic activity of a country, but of course not all activity is well monitored. So one has to work with proxies and estimates based on various indicators and surveys. Those efforts take time, and GDP estimates must be corrected after they’re first released. Everyone knows the initial GDP measure is imprecise and that revisions can be rather dramatic, yet the initial release receives the lion’s share of press coverage. Later revisions receive little attention, yet they matter quite a bit. The latest GDP release included revisions going all the way back to 2012. ALFRED, a sibling of our FRED database, allows comparison of different historical “vintages” of data for many series included in FRED. The graph above shows the quarter-to-quarter growth rates for the two latest releases of U.S. real GDP. One can easily see that there have been some stark changes: In particular, the measure for the first quarter of 2015 was initially a much-discussed negative growth rate but was then revised to reveal a positive growth rate. If these revisions average out to zero, we simply have an imprecise measure of GDP and that’s that. But if these revisions lean in one particular direction, then we may have some systematic bias in the initial estimates. One way to look for a significant bias is to examine the levels of GDP across data vintages. (The levels are the cumulation of the growth rates.) The graph below shows these levels, and one can see a difference between the two series all the way to the last data point. How these graphs were created: For the first graph, search “real gross domestic product” on ALFRED. Choose “Series” instead of “Site” on the drop down menu (which is to the left of the search field). Click on the first choice and then on “% Chg” under “Units” below the graph. The second graph is simply the default version of the first graph, which has units in billions of dollars. The four components of GDP—investment spending, net exports, government spending, and consumption—don’t move in lockstep with each other. In fact, their levels of volatility differ greatly. We can observe this in FRED by graphing the annual percent changes of each component. Investment (solid red) and net exports (solid yellow) are extremely volatile, varying greatly during economic contractions and expansions. In contrast, government spending (dashed blue) and consumption (dashed green) are highly stable; although they also vary with the business cycle, they do so to a much smaller extent. This pattern can be important for the effectiveness of monetary policy. According to economic textbooks, when the Fed lowers interest rates, investment spending and U.S. exports become cheaper, all else being equal. So, when the Fed lowers rates, it affects the two variables that disproportionately contribute to any given change in GDP. How this graph was created: Add all of the series listed below to one graph with the “Add Data Series” function. Set their units to “Percent Change from Year Ago.” Use the “Line Style” option to give solid lines to the first two series and dashed lines to the last two and set “Line Width” to 1 for all four. Finally, take advantage of the “Color” option for each series to color the lines as you wish. Series used in this post: GPDIC1, NETEXC, PCECC96, GCEC96. 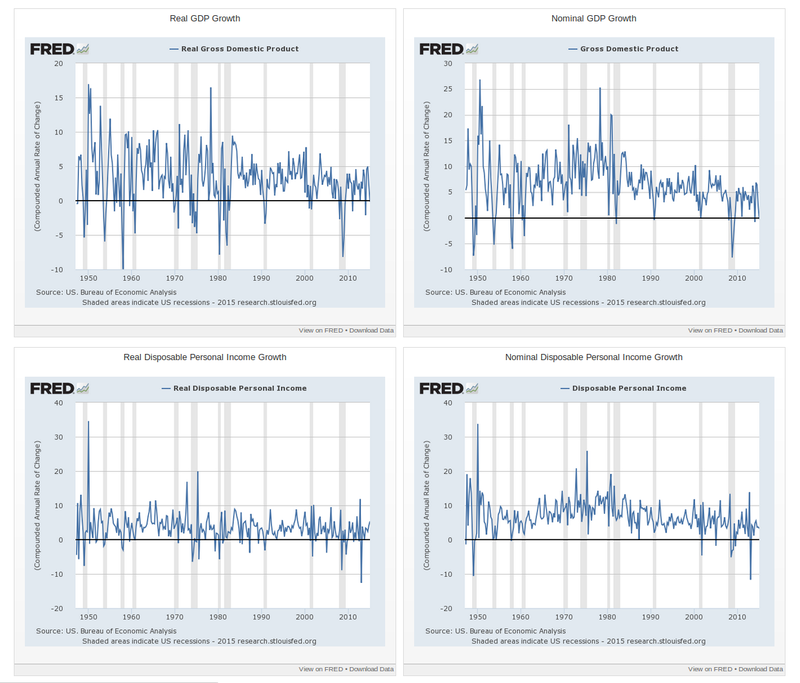 Sometimes you need to consider an assortment of data, and FRED’s dashboard tool lets you assemble and simultaneously view multiple economic variables. For example, the image above links to a dashboard of “stress test” indicators that help the Fed assess the resilience of banking institutions. As part the Dodd-Frank Wall Street Reform and Consumer Protection Act, the Fed crafts hypothetical economic scenarios (e.g., a spike in interest rates or a sharp contraction in GDP) and then analyzes banks to see how they would hold up. To learn more about the Fed’s stress test methods, click here. How this dashboard was created: Go to the Fed’s stress test website, which is linked above, to see the variables used. Search for these stress test variables (or close equivalents) in FRED. Create each graph and then select “Save Graph.” If you have a FRED account, you will be prompted to log in. If you do not, you must create an account. Once you’ve saved as many graphs as you’d like, go to “My Dashboards” and click the “Create” button. To add the saved graphs, use the “Saved Graphs” option under “Add Widget.” If you are logged into your FRED account, you can save a copy of the dashboard to your account and then customize it. To learn more about FRED dashboards, click here.